Mill-Max now offers a choice between .050" (1,270 mm) and .100" (2,540 mm) grid horizontal Z-Bend sockets and headers. For low profile IO applications, these surface mount SIP socket strips are assembled parallel to their board surface. 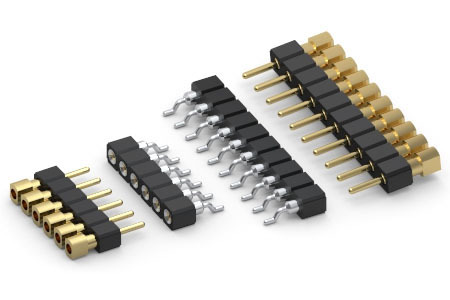 They are ideal for placement near the board edge for easy access test connections and creating pluggable adapter modules which can sit perpendicular to the motherboard, effectively conserving precious board real estate. The 310, .100" (2,540 mm) grid, horizontal Surface Mount Z-Bend Sockets use MM #1023 receptacles that accept pin diameters from .015" - .025" (0,381 - 0,635 mm.) These sockets are rated 3 amps per position. Series 801, .100" (2,540 mm) grid, uses MM #1303 receptacles that accept pin diameters from .025" - .037" (0,635 - 0,940 mm) and .025" (0,635 mm) square leads. These sockets are rated at 4.5 amps per pin position. Standard configurations are available from 2-10 positions with a .005" (0,127 mm) co-planarity rating. They come packaged in tubes. A tape and reel option can be quoted upon request. Note: The socket is available in longer strip configurations, but co-planarity will need to be determined. Please contact our engineers for more information. Series 850, .050" (1,270 mm) grid horizontal SMT Z-Bend Headers are available with .016" (0,406 mm) diameter solder tails and pluggable pins, using MM #4006-1 pins. Series 851 horizontal SMT Z-Bend sockets use MM #4890-1 receptacles that accept pin diameters from .015" - .020" (0,381 - 0,508 mm.) These headers are rated at 3 amps per pin position. Standard configurations are 2-20 positions with a .005 (0,127 mm) coplanarity rating.